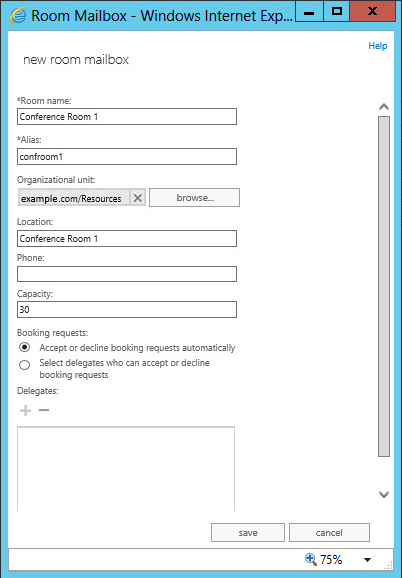 In this example, we will create an email box in Exchange for Conference Room 1. The email address for this room is confroom1@example.com. In the left panel of Exchange admin center, select recipients. At the top, select resources. Select the plus icon > Room mailbox. Complete the New Room mailbox form and select save. When scheduling a meeting using Outlook's calendar, the Add room option will display Conference Room 1. After scheduling a meeting, an email will be sent to your inbox from Conference Room 1, stating that the request was accepted.